11147: How to set up statutory maternity pay (SMP) - PAYE-Master. Article Name How to set up statutory maternity pay (SMP) - PAYE-Master. How do I set up statutory maternity pay in PAYE-Master? To get PAYE-Master to calculate SMP automatically we need to save some details about the absence in the employee absence calendar. • Go to "Employee" > "Details" OR click on the Employee button on the toolbar. • The Employee Details window will be displayed. Please Note: This feature is specifically for the automated calculation of absences, rather than the recording of absences! • on the "Absence Type" window select "SMP" and click "Submit"
• Start Date - The date of the employees' first day off work. • End Date - Set this as one calendar year after the "Start Date" entered above. Please Note: An employee is entitled to take 52 weeks leave for maternity. Only the first 39 weeks of the leave qualify for statutory maternity pay. The employee can decide to take the final 13 weeks as unpaid leave if they wish. For this reason, we always recommend you configure the leave to cover the whole 52 week period. If the employee does return to work earlier than this it is easy to stop SMP rather than trying to extend a leave period beyond the originally specified "End Date". To stop SMP before the recorded end date you need to save a "Returned", see below for details. • Expected On - This field records the date the baby is expected to be born. This is important as it determines which pay periods are considered for the calculation of the employee average earnings. This date should only be taken from the MAT B1 form provided by the employee. • Medical Evidence Received - You need to tick this box to confirm you have received the MAT B1 form from the employee. You must not make any SMP payments without suitable Medical Evidence being provided. These are all the details that are required for PAYE-Master to calculate an employees' eligibility for SMP. Once completed click"Save". Once you have saved you should see the "Average Weekly Earnings" display a value. If PAYE-Master doesn't calculate the employee as being eligible for SMP it will display why in "Reason Not Entitled". • SMP payments will begin on the first pay date that is at least 7 days after the specified start date. Please Note: You may need to adjust the employee basic pay in variations while paying SMP. The calculated SMP value is the minimum pay due for the employee. This does not include any contractual maternity pay they may be due, this should be recorded as normal pay rather than SMP . • Returned - If the employee returns to work sooner than the full 52 week period, enter the actual date that the employee returned to work in this field to bring SMP to a close. • Join Date - The date the employee joined your company. This field cannot be amended here; if this is incorrect it needs to be amended within the employee details for this employee. An employee must be employed for more the 26 weeks to qualify for SMP. • Average Weekly Earnings - This field displays the average weekly gross pay. Where PAYE-Master cannot determine this figure, it can be entered manually. PAYE-Master requires adequate pay history to automatically calculate the employees' average weekly earnings. If PAYE-Master does not have enough history, you will have the opportunity to enter the employee’s average weekly earnings. • Reason Not Entitled - In the majority of cases PAYE-Master will be able to calculate if an employee is entitled to receive payment and will automatically populate the 'reason not entitled box'. Sometimes the reason an employee is not entitled will only be known by the employer. In this case, the reason should be manually entered. • Actually Born On - This field records the date the baby was born. Note that SMP can be paid without completing this field. • Working During Leave / On Trade Dispute - During her maternity leave, if the employee spends any time involved in a trade dispute or does any extra work (beyond the 10 KIT days allowed) then you should record the number of weeks here. This affects her entitlement to SMP and so must be recorded. • The total box cannot be edited, this figure will be automatically generated by PAYE-Master. • MPP started by premature birth - If the baby is born early, you should check this box. Otherwise, leave it blank. • MPP started by pregnancy-related illness - If the employee is off sick with a pregnancy-related illness in the four weeks prior to the due date, then their maternity pay should start on the second day of this illness. Check this box if this applies to this employee, otherwise, leave it blank. • Stillborn - If the baby is stillborn, check this box. Otherwise, leave it blank. Please Note: The KIT Days button will only be activated once leave details have been saved. An employee can return to work for up to 10 days during her maternity leave, these are known as Keep In Touch (KIT) Days. 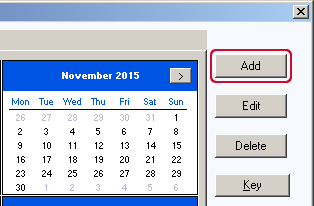 • To add a KIT Day, click the "Add" button Type in the date and a note for your future reference. The maximum number of KIT Days allowed is 10. After 10 dates have been entered, the Add button will be disabled. Save button - Use this button to save any changes that you have made. PAYE-Master calculates SMP based on a WEEKLY payment, not a daily rate. The start date needs to be at least 7 days before your pay date to allocate one lot of weekly SMP.